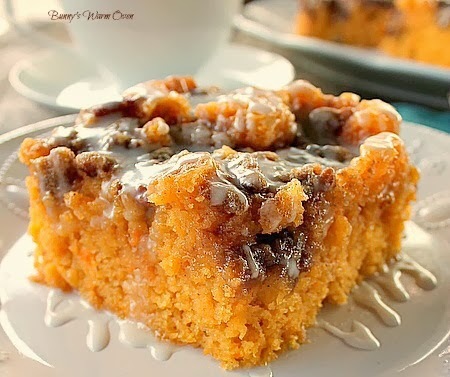 Incredibly delicious…a dense moist sweet potato cake that tastes like a cinnamon roll. Paul and I absolutely love sweet potatoes. We love them any way we can have them, even in cake. I saw this recipe on a Face Book recipe group called GFCAV Presents Food Recipe Central. It was posted by Sharon Daniel-Roan. Thank you so much Sharon for this amazing recipe!! I copied and saved it because I knew I was going to make it, I just didn’t know when. Today was the day. The recipe calls for 2 cups of sweet potatoes. I peeled and diced up 3 small sweet potatoes. I boiled them until tender and then gave them a whirl in my food processor to make sure they were nice and smooth. I got about 2 1/3 cups of sweet potatoes. I followed the recipe exactly until it came to the cake topping. Paul doesn’t like sweets as much as the sugar queen does so I cut the topping recipe in half and added 1 cup chopped pecans to give the cake a nice crunch. It was more than enough to cover the top of the cake. The topping is moist, I took it in my hands and broke pieces off until the top was covered. Because I halved the topping I didn’t swirl it through the cake, I just let it sit on top. Since we’re making a cinnamon roll cake, let’s take about cinnamon. I’ve been baking for over 30 years and never knew there was a difference in cinnamons. For this recipe I used Flavor Of The Earth Ceyon Cinnamon Powder. After opening the Ceyon Cinnamon and comparing it to the brand that I always buy I couldn’t believe the difference in aroma and taste, it also has health benefits to boot. Another terrific reason to use it. My cake baked at 350 degrees for about 35 minutes. I let it cool slightly while I made the glaze and then poured that over the cake. Paul couldn’t believe how good this was, he loved it! This is one amazing moist delicious cake!! I hope you love this as much as we did!! I made this cake and halved the topping and glaze recipe. It worked out perfectly for me and my husband. Other people have commented that made the recipe as is and decided the topping and glaze as written in this recipe was just to much and they would also half the recipe next time they make it. The ingredients for the topping and glaze are the original recipe amounts ( written below). Please half the topping and glaze if you don’t want that much sweet in the cake. In a large bowl combine flour,sugar,salt, and baking powder and nutmeg. Stir with a fork to combine. In another large bowl beat sweet potatoes and milk until smooth. Add beaten eggs, and vanilla, beat until combined. Slowly add flour to sweet potato mixture, mixing until just incorporated. Slowly stir the melted butter into the batter until well combined. Pour batter into prepared pan. Make topping. Mix all the topping ingredients together until well combined. Drop evenly over the batter and swirl with a knife. Bake cake for 30- 35 minutes. After cake is baked, cool slightly while making the glaze. Combine glaze ingredients mix until smooth. Glaze cake while still warm. From time to time Bunny’s Warm Oven may have “affiliate links” in a blog post or in a recipe ingredient list. Which means if you click on the link and purchase an item I receive an affiliate commission. Thank you for supporting my efforts at Bunny’s Warm Oven when you shop. Yum!!! I wish I had some sweet potatoes. I didn’t know until recently about the cinnamon either. I thought if it said cinnamon that meant the real deal. Not true. Totally drooled all over my keyboard, this looks fantastic!! cake flour or all purpose? I just made this cake today. Oh how I wish I had reread what you said about doing half the topping. I thought it seemed too much but didn’t want to mess it up. I will half it next time. Just way too much for us. It was good, but we would have liked it much better with less butter. Also, I used soft white wheat (I grind myself) and sucanat instead of sugar. I think I will add uns.coconut next time too. I didn’t put pecans either. Charlotte, I guess that the reason they have so much topping is because they swirl it into the batter of the cake so some of it is inside and on top. My husband isn’t as much as a sugar lover as I am so I opted for half the topping recipe and just let it sit on top but you could swirl that to if you wanted to. I hope you do make it again with your adaptions! Joy, thank you for the opportunity to share at your party! Mary, this is TOTALLY happening in my kitchen this weekend! I just bought a load of sweet potatoes yesterday for a recipe & got more than I’ll need! Yum; can’t wait to give it a go; it looks amazing! Thank you Anyonita! I was so happy to find this little gem. I hope you love it as much as we did! This has become a family favorite! I use yams and roast them to get all the sugar out of them that I can. I also halfed the topping, that worked better. What an incredibly most cake. Fabulous!! Ummm yumm, I look so forward to trying this. So glad I was browsing Anyonita Nibbles on facebook and saw this! Just made these! Smells yummy. Only down fall so far is that in the direction it left out the ingredient nutmeg. So I had poured batter in pan before I noticed the nutmeg part. I did add nutmeg into topping and did extra swirling. Oh I’m sorry Terri! I just fixed that and put the nutmeg in the directions. Please let me know how you like the cake! Good morning Hannah, first to try and figure out why the cake wasn’t what it should have been, did you substitute anything in the recipe? As far a not being sweet, with the topping and the glaze on it, I don’t understand how it was not sweet? Have you made these as bars vs the cake? Just wondering if one recipe would fit an 11×18 pan and what the baking time difference would be. Good morning Kristie, I found this conversion chart that will be very helpful in figuring out a pan size. from the chart it looks like a 10x15x1 inch jelly roll pan would be good for a cake made in a 13×9 inch cake pan. I would bake at half the time of the cake made in the 13×9 inch pan, or at least start checking it to see if its done. Julie thank you for coming back to say you baked it and loved it! Of course, omit the glaze if you like, it’s your kitchen! Thank you for stopping by! As I have no fresh sweet potatoes nor yams at present, can I substitute canned yams or pumpkin with reasonable success? Yes Karen you can, let me know how it works for you! Do you bake the sweet potatoes or cook them on top of the stove. I have to confess I have never cooked sweet potatoes before so I want to do it right. Hi Jerri! Just peel them, cube them and boil them until tender. If you have anymore questions, don’t hesitate to ask!! You can also boil the potatoes whole in water until they are fork tender. Then peel and mash or run through your food processor. Much easier than cutting up the raw potato. Even easier than boiling. Just wash and bake like you would a white baked potato, at 350 to 400 degrees for 30 minutes to an hour, depending on the size of the potato. I put them on foil, on a baking sheet (some of the sugar/juices will usually leak during baking, and the foil saves clean-up). When the potatoes are soft, remove from the oven and allow to cool until you can peel them. Butter, like for white baked potato, and serve, or cool and mash the peeled potato for use in recipes like this. Plain cooked sweet potatoes also freeze and reheat well. Thank you Diane for the great tips! I didn’t know you could cook and freeze! That’s awesome! Yum!! This looks super moist and delicious! I don’t like cakes super sweet, so I would probably go half on the topping like you did. Pinning it for things to try! Yes Thao, and half the glaze as well. Thank you for stopping by! Thank you Mila,it’s very appreciated! What an awesome combination! It’s all stuff I have on hand and sounds delicious. I’ve pinned it for myself and my readers! Yes all purpose flour is great. Wow, does this look good! My husband and I love sweet potatoes and he especially loves cinnamon rolls! pinned! 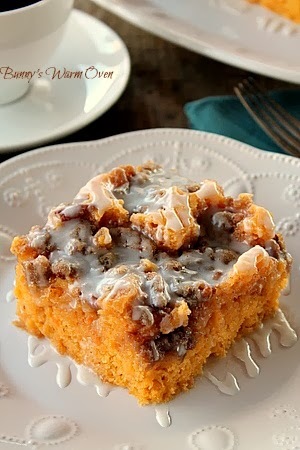 I love sweet potatoes any way as well, but when they taste like a cinnamon roll, well that has to be tops! It’s wonderful Heather, who knew sweet potatoes could be made to taste that good in baking! Thank you for stopping by!! Thank you soooo much for coming back and telling me you made it!!! I love it when that happens! You made my day! OMG YUMMY! I love sweet potatoes and this just made me hungry for them! Pinning NOW! G’day! Sounds yum Mary! Thanks for sharing at our #SayGdayParty! YUM! This cake looks so moist and beautifully orange! I am with you and the more topping the better, but I do love your addition of pecans! Hi could I substitute the cake with real cake mix (Betty crocker). If so how would the recipe work then? Thank you I made this yesterday. It turned out pretty good. I will making for thanksgiving this year. However I will cut the topping ingredients in half this next time! Note I used a regular Betty crocker butter cake mix. Thank you for coming back Kiala! Made these today and they came out dense and nothing like the picture. Not a cake like texture at all? Followed the recepie exactly?? Fez, in order for me to understand why the recipe didn’t turn out I’d have to know , where there any substitutions in the recipe that you made? Mine came out very dense -but moist -as well…almost custardy. It was delicious though! Only cahnges are that I did not add the glaze, mixed walnuts into the brown sugar mixture. Thank you for coming back MaryKbrown! Thank you Shannon! I’ll be there! can I use self rising and not add the salt and baking powder?? Good morning Kelli, Self rising flour has 1 1/2 tsp of baking powder per cup of flour. There are 3 cups of flour in the recipe and 2 tsps of baking powder. If using self rising flour I would add 1/2 tsp of baking powder to the self rising flour just to be on the safe side. Thank you Girls, I’ll be there! Oh. My. Goodness. This looks so incredible! I found you via Best of the Weekend feature. Pinning as fast as I can! I do understand your concerns Barbara and have addressed them in the recipe right before the topping and glaze ingredients. Thank you Sweetie! Exactly… Standing butter, unbaked center. Topping needs cut back. I was going for the sweeter way but end up ruining the cake with using whole recipe for topping. I ended up salvaging it and stirred it all up, making a sort of bread pudding out of it. Serving with whipped cream. Not sure what I did wrong… Maybe didn’t swirl enough. But the butter separated and was all oily on top. Not impressed as of yet. Haven’t tried it yet. Kinda bummed. Thanks though, will try again. Barbara are you talking about the glaze? The butter in the glaze separated? Vietnamese cinnamon is the best hands down. Penzey’s is killer. Cake was good, been baking many moon’s and would still fix that topping recipe. Too much room for mistakes. Thanks Dear for a great cake! Made this cake yesterday. Love sweet potatoes and cinnamon rolls! But the cake came out very dense….like bread pudding. My husband actually liked it that way but I wanted it more like cake. I didn’t substitute anything in the recipe. What would cause that to happen? Maybe I had too much sweet potatoes? The flavor was good though. The recipe calls for 2 cups sweet potatoes, you could cut back 1/2 cup and see if that helps make the texture more to your liking Cassie. The only thing I could think of that would make it that dense would be the sweet potatoes. Our family can’t have dairy. Do you think this recipe would work with almond milk and vegan butter? Also, what kind of cake pan and did you grease or libel with parchment? Does this cake get served in pan or do you take it out then glaze it? Thanks so much for sharing. This looks amazing! Ruthann, I don’t have any experience with cooking with almond milk or vegan butter so i really can’t give you an opinion on it. The cake was made in a 13×9 inch pan that was greased. What I can say is maybe you could half the recipe, make it in a 9 inch square pan and use the almond milk and vegan butter to see if it works. Oops * line with parchment. Wasnt sure if you put pecans in topping or glaze. I put them in the topping. Either the topping or the glaze is fine to add the pecans to Debbie. Thanks for the recipe. I made it today for a church potluck and it came out really well. Mine was moist and tasted really great. Others enjoyed too. The only problem was it did not look great as it slid around while driving to church so it did look great but it tasted wonderful. I used about all the topping and the only thing I would change is to try to get down further into the cake. I did use half the glaze and that was the perfect amount. I made it as is, though I used self-rising flour and I added about 1.5 teaspoons of baking powder. I will have to make this again. I loved it! Thank you Joshua for coming back to tell me you made it, you made my day! And thank you for stating your substitutions, it’ll be helpful to someone else thinking of making it with self rising flour. I made this yesterday. Twice. I didn’t think the topping or glaze was too sweet at all. Love the addition of pecans. Already have requests to make this to start off our thanksgiving day. Anomar thank you for coming back to tell me you made it!! I love that! have a wonderful Thanksgiving! I made this for my son’s preschool Thanksgiving program. Disappointingly, mine also came out dense and not cake-like. It was as if it never rose. Came out more like, mashed potatoes with a crust. It was; however, very moist as the recipe suggests. I followed recipe exactly (2 measured cups of cooked sweet potato, 4 tsps. of baking powder, etc.) Don’t know what went wrong. The flavor was great, just wasn’t thrilled with texture since I was expecting cake. Any suggestions for changes if I keep this in my baking repertoire? Any advice would be much appreciated. Thanks! Happy Thanksgiving! Try cutting back on the sweet potato Carlyn, maybe by 1/2 to 3/4 cup. 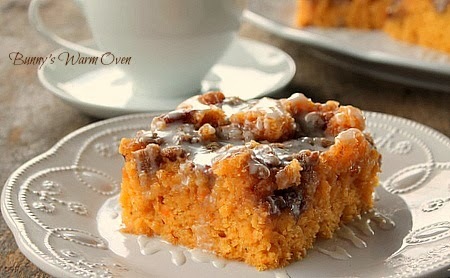 After the sweet potato cinnamon cake is made, will it have to be put in the frig.? No Renee, it doesn’t need to be. Thanks for the recipe! Baking it now for Thanksgiving, smells heavenly. Can’t wait to try it. I used one large can of Bruce’s yams, drained and pureed in the food processor. Measured almost perfect 2 cups. Only put nuts on one half since mom can’t have pecans. Been looking for a great sweet potato cake recipe. Cake is delicious but very dense. Followed recipe every step. I give an A for taste and C for texture. I’ve never commented in a recipe before, but I have some thoughts on this, so here goes…I made this for our Thanksgiving meal. I followed the recipe to a tee and as was suggested, halved the topping and glaze ingredients. It is a good cake, much better the day after baking. However, for my family and friends, I would make the entire amount of topping and glaze. The cake is a little bland and definitely needs it. I will be making this again as we have a plentiful supply of sweet potatoes. I am a Sourhern cook, so maybe that’s the need for more sugar for our palette. It would be a great coffee cake to serve with a brunch, so next time I make it, I’ll be going all in for the sugar, butter, and all other high cal yummy things! Nanakay thank you so much for commenting! It really helps other people to see someone that has made the cake and commented on it. I hope your Thanksgiving with family and friends was wonder! i just made the cake and it tuRend put very dense. I did use a jar of my home canned sweet potatoes so wonder if that was the problem. It is a dense cake, maybe cutting back on the sweet potatoes by a 1/2 or 3/4 cup would help with the texture Trish. Can you make the night before, all but the glaze and refrigerate over night, then bakeep in the morning? I am not a morning person but would love to make this for my kids for breakfast before school. You mean make the cake batter and refrigerate it? I don’t know how that would work. maybe you could measure out all the dry ingredients and combine them and have the sweet potatoes ready and just mix everything together and make in the morning. You could make the glaze ahead. Thank you for coming back to tell me you made it zeewmn! I Made the Frosting (Only) and it was……..how do I say it calmly…..????? AMAZING!!!!!!!!!!!!!!!! if just the frosting is that good I wonder what the cake tastes like I will DEFINATLY try it!!!!!!!! Hi Teresa, Thank you so much!! I would suggest you reading the comments on this cake before making it. Making the whole batch of glaze was too much for some people. Better to use half as I did, then make more if you want more. Thank you for visiting! Mine turned out more like a dense pudding anyway it’s yummy.I figure out it’s my sweet potato. Thank you Linda for stopping by, and I’ve very happy you made it and liked it! Hi! Bunny it’s Linda fron Australia.Thank you so much for your kind response. I took the sweetpotato cake to shared it with my workmates & the response is unusual & incredible delicious. In future I will cut back the sweetpotato by 3/4 cup & I will let u know. Linda thank you! Coming back and reporting how it does cutting back on the sweet potato will help other people that want to make it. You’re a gem, thank you!! this looks really good. I make a honeybun cake that everyone loves but as much as I like sweet potatoes my husband is not a big fan. I was wondering if you could substitute the sweet potato for pumpkin. Your thoughts. Hi Angel, this is just my opinion but I think it would work. You might want to cut back on the pumpkin by about 1/2 a cup, let me know how it works out if you try it that way! Can you use a bunt pan???? Debbie this is best made in a 13×9 inch pan. it’s a very dense cake. Hi Bunny! I just wanted to let you know that this cake is off the charts!!!!! I made this for ST PAtricks day …… I wanted to keep my Menu fun and incorporating potato in my dessert seemed like a good idea. It was a Great idea!!!! Everyone went Googoo over this cake , it’s got it all and then some 🙂 even the ones who brought it home ,called me the day after and went crazy over it. I wanted to thank you for sharing this little Gem and know that you have been permanently stored in my Family Recipe Book; I just happen to be putting one in the oven now ….. Thanks and Happy Baking ! Thank you so much Candace!!! Happy Baking to you Mamma!! Just made this cake (with topping and glaze halved) and it looks and smells to die for!!! I’m bringing it to work so I can’t taste it yet. I’m curious if I’m not serving it for a day or two, do I need to keep it in the fridge because of the sweet potato? I’m thinking that all the sugar would act as a preservative but I don’t want it to go “bad” if I leave it out on the counter. Thoughts? Hi Liz, no need to put it in the fridge, it’ll be just fine. Let me know what you think of it! I love it Lori! Thanks for coming back to tell me you made it! Just made this cake. Smelled amazing while it baked. Unfortunately, the texture was not that of a moist cake, but so moist it’s almost rubbery. Not sure what went wrong. Followed the cake recipe as written. Lina, I’m going to guess the sweet potatoes , if you wanted to try it again, cut back on the sweet potatoes by about 1/2 cup. I really like the flavor of the cake but it was not cake texture at all it was doughy kind of like pie. I followed your recipe exactly I halved the glaze but not the topping. What can I do next time to ensure the cake isn’t doughy. I also cooked it 10 extra minutes and have it back in the oven now to see if it need to cook longer. Chae, see if cutting back on the sweet potatoes by 1/2 cup helps. I just made this cake today for my husband’s birthday & it couldn’t have been more delicious! I took your advice about halving the topping/glaze part & it was perfectly sweet. I was out of pecans (and walnuts) but so badly wanted that little crunch factor on top, so after browsing through my cupboards I noticed some pretzels & decided those would do nicely. I added them to the glaze & said a prayer. But they honestly worked out beautifully. The saltiness works so well with the sweet glaze & they are just crunchy enough. Eden so very happy you made it and loved it!!! Thank you so much for coming back to tell me. Let me know how the muffins work out Eden!! I made for the first time today. I used a gluten-free flour blend and it came out wonderful. Followed your directions about cutting topping and glaze in half and it was good. Didn’t make it overly sweet. Need to watch my sugars. Thanks for the recipe. Thank you Renee! Very happy you made it and loved it! I’m so happy you loved it Alicia, and great thinking there with the topping!! hi! did you use half the recipe for the glaze also? or just the topping? i love sweet potatoes and was asking to make dessert for a big family gathering! i need to impress and this looks like it will blow their socks off! I halved both the topping and the glaze Emily. I hope your family loves it Emily! Regular all purpose flour Dana. Sandy you can buy it on Amazon here,https://www.amazon.com/s/ref=nb_sb_ss_sc_1_5?url=search-alias%3Daps&field-keywords=ceylon+cinnamon&sprefix=ceyon%2Caps%2C195 or just use the cinnamon you have. I just made this cake and it also did not come out right for me. I cooked it an extra 5 mins since the toothpick was not coming out clean but you didn’t say to do the toothpick test so I went ahead and took out after that extra 5 mins thinking that maybe the topping was preventing it from being clean. It looks like pumpkin pie, a solid filling, nothing like a cake at all. And worse, to me it even tastes doughy. I’ve now put it back in the oven hoping it will at least lose the doughy taste, but I really don’t expect cooking it longer will restore the texture, especially since it had been out of the oven for at least 2 hours which would have given it plenty of time to set, I’m just hoping the raw flavor goes away. I know you are telling people to cut back 1/2 cup on the sweet potatoes but nobody is going to do that before they have made the cake. I would suggest that you just change the instructions to 1 1/2 cups because so many people are having this issue. Also, can you add how we are supposed to tell if the cake is cooked through? Does the toothpick test work on this cake if it is cooked through? Is it really one and a half cups of milk? Or is it supposed to be a half cup of milk? Is this where the recipe is going wrong? You have written “11/2 cups milk”, with no space, not “1 1/2 cups of milk”, people are interpreting this as one and half cups of milk but is it a typo and it is really only supposed to be 1/2 cup of milk with no “1” in front?? When I added that much milk I said this looks more like a custard which would explain why it came out more like a pumpkin pie consistency. This consistency is so off it is just really unappealing. Cooking it longer did eliminate the raw dough taste but now it is dry around the edges and rubbery, really not good at all. The only part of it that is any good is the icing on top with the pecans. We are going to scrape off the icing and eat it and throw the rest in the trash, it is that bad. I am so disappointed because it looked so tasty in your picture. Can I substitute the flour for coconut flour? Good morning Linda. I had to look up coconut flour to find the answer to your question. Here’s what I found…In baking, you cannot substitute coconut flour for wheat or other grain-based flours at a 1:1 ratio. They are not equivalent. Coconut flour is extraordinarily absorbent and very little coconut flour is needed to successfully produce a recipe. In baked goods, you generally want to substitute 1/4 cup to 1/3 cup coconut flour for 1 cup grain-based flour. You will also need to increase the number of eggs. In general for every one cup of coconut flour you use, you will need to use six beaten eggs in your recipe in addition to approximately one cup liquid such as coconut milk. When baking with coconut, it is best to use established recipes rather than waste considerable expense and time with experimentation. Marla, it’s 1 and a half cups milk. This has to be the most controversial recipe on my blog. Some people make and love it others not so much. WE loved it as is, I guess it’s just a matter of texture. I have made this cake many times since finding this recipe. I have made it with fresh sweet potatoes as well as canned. I like it better with fresh, but both are amazing! It is hugely requested at family gatherings, especially around the holidays. It has become a new tradition to make it for Christmas morning breakfast. I always make it with the halved topping and glaze recipe, and add in some chopped, toasted pecans to the glaze. Heaven on a plate!! Amanda this is probably the most controversial recipe on my blog. People either love it or have problems with the texture of the cake. I’m so happy you loved it! I have a cousin whose name is Brenda and her nick name is Bunny or as her dad so fondly called her till the day he died Bun Bun🤗. I live in San Antonio and went to church with the Bostows many moons ago. I am FB friends with Cierra and saw her birthday wish to her dad, so I went on his sight and he mentioned you blogging so I have spent the last 2 hrs looking at your recipes. I love to cook plus you just sound like my kinda gal. So is your sight for your blog the same sight as your recipes Bunnys Warm Oven, or is it different? I look forward to many more hrs. on your sights. Awe thank you Nanette! The Bostows are a special family aren’t they? I hope you come to visit my blog again, thank you for the kind words! Is it “4” teaspoons of baking powder? Seems like a-lot. Hi Donna, yes it’s 4 Teaspoons, I know it does sound like a lot but that’s what the recipe called for. I made this with leftover sweet potatoes. I took it to a church meeting and everyone loved it. You were right half the topping and half the glaze is plenty. Wonderful Deb! Thank you for coming back to tell me! I read over a good portion of the comments, but didn’t see anything on a milk substitute. I rarely use milk, but have almond milk for its 3 month. Life. Any idea if it can be used? I’m already cooking at Altitude so floury outcomes are a norm. Still learning. shley I found an article for you that says yes you can bake with almond milk. Check the article out here…https://www.livestrong.com/article/553567-substituting-with-almond-milk-for-baking/ Let me know how it goes if you use the almond milk, would be helpful to anyone else who wants to use it in the recipe. Love this recipe, it has become my new go to cake! To save time, I cooked my sweet potatoes in the microwave, takes about 7 -12 minutes depending on size of potatoes and number of sweet potatoes you are cooking. I then place in freezer while I prepare recipe. Then remove from freezer, use a spoon to easily separate sweet potato from peel and add to recipe. GrammsCandy thank you so much for coming back to comment. Your tips will be helpful to someone else wanting to make the cake. Thanks for taking the time to comeback, I love that. THIS CAKE WAS AMAZING!!!!! Thank you for sharing!!! Made it last night and it was SO SO good! Halved the glaze and topping like you said and it was the perfect amount of sweet. Wonderful Sarah, thank you for coming back to tell me! I was excited to finally make this cake as I had it bookmarked for a while. Was so disappointed, feels like I wasted so many ingredients and so much time! It came out very dense and stodgy. Like a thick flan. I followed the recipe except I added a bit more nutmeg. I used to be great at baking as a kid/teen. I’ve been baking again for the past couple years and my cakes always turn out like this. What am I doing wrong? I’m not sure what happened. I’m sorry Ada, it seems that people either love it or don’t. I don’t think you did anything wrong. it’s just a matter of taste. Thanks for your response! It wasn’t the taste, it was the texture of the ‘cake’. It didn’t come out like a typical cake or your picture, it came out like sweet potato pie texture but much thicker/dense. I’m not sure how to make it ‘fluffier’ or lighter like in your picture. Hi Bunny! I know I’m late to the party, but I saw that you consider this your “most controversial recipe, and I wonder if geography may come into play. I’ve lived in several states and have found that “sweet potato” is not always interchangeable with “yam” (as it is where I grew up in the Midwest). One commenter noted the color was different. If she used the white, “hard” sweet potato it would most definitely result in a different color and, more importantly, texture. I am certainly not assuming this is the case, but having been scolded for referring to the white and orange potatoes interchangeably in a few states, I thought it might be beneficial to point out that we should be using the orange variety, frequently sold as “yams”. That is a whole other debate that can be found by Googling – LOL. OH MY GOD. I made this for Thanksgiving because we had a whole bunch of sweet potatoes lying around. I literally would eat this for whole meals and dreamed about it when I wasn’t eating it. I halved the glaze and topping and it was PERFECT. I am making it now for my work Christmas party. I am so excited!